Celebrity parents Busy Philipps, Brad Pitt, Seal, Halle Berry, and mom-to-be January Jones were photographed out and about this week with their kids. "Cougar Town" star Busy Philipps and her daughter Birdie do a little shopping at Whole Foods in L.A.
Brad Pitt is in Malta filming his new movie "World War Z". 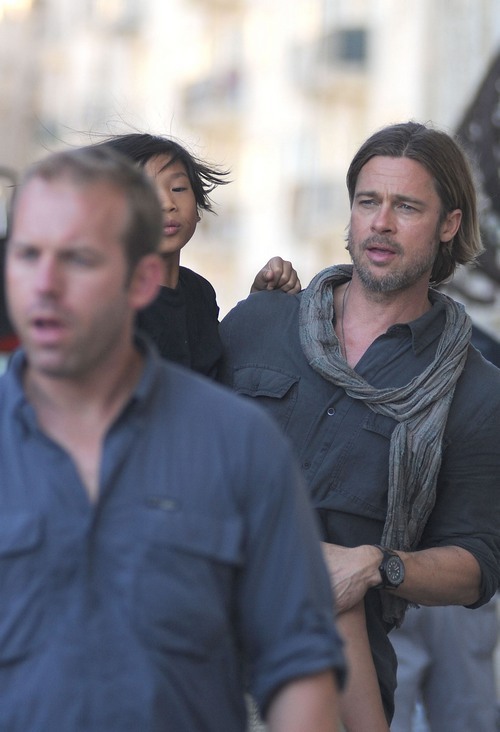 He was spotted leaving the set with his son Pax Thien yesterday afternoon. Halle Berry picked up Nahla from preschool in West Hollywood. Expectant mom January Jones heads to her prenatal yoga class. Seal was snapped out and about in NYC with his three oldest kids – Leni, Henry, and Johan.